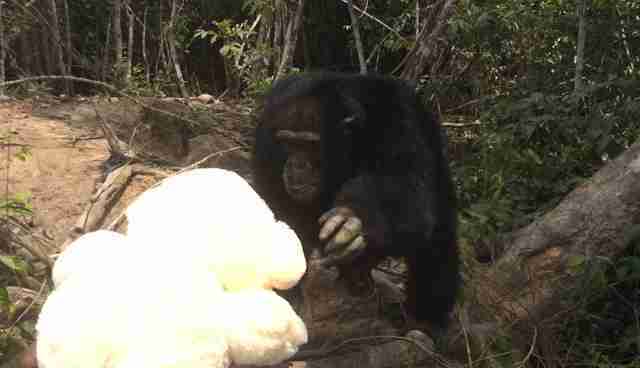 He might be the loneliest chimp in the world - but he just made a friend. Ponso is a roughly 40-year-old chimp who was abandoned to die on a deserted island off the Ivory Coast after being used in medical testing. He was kept alive for years by a villager named Germain, who would drop off bananas and bread for the aging chimp as the island had no natural food sources. Last week, Germain and a friend, Mohamed, stopped by to drop off Ponso's daily meal, and they brought an extra-special gift along: a brand new teddy bear. "Ponso was very interested by the teddy bear we bought," SOS Ponso, a group dedicated to helping him, wrote on Facebook. "He took it and brought it on the island, far from Germain and Mohamed." A video shows Germain and Mohamed calling to Ponso as they row up to the island. He runs out to greet them, climbing up a nearby tree. Once they land and he sees the teddy bear, he rushes down and grabs it, carrying it a few yards away before sitting down to play with it. The video also shows the men handing food to Ponso, who inspects each item carefully before laying it aside. SOS Ponso says his lack of immediate interest in food is a good sign, as it indicates he's well-fed. After receiving the food, Ponso reaches out to grab Germain's hand, seemingly in thanks. In another video, Ponso can be seen playing with Germain, laughing out loud when his human friend makes noises and tickles him. While roughhousing with a chimp generally isn't a good idea, it's clear the two have a special relationship. After all, for the past several years years, Germain was all he had. Ponso was one of dozens of chimps who were abandoned on a string of islands off the Ivory Coast and Liberia by the New York Blood Center (NYBC), which had used them for years in often painful medical testing. 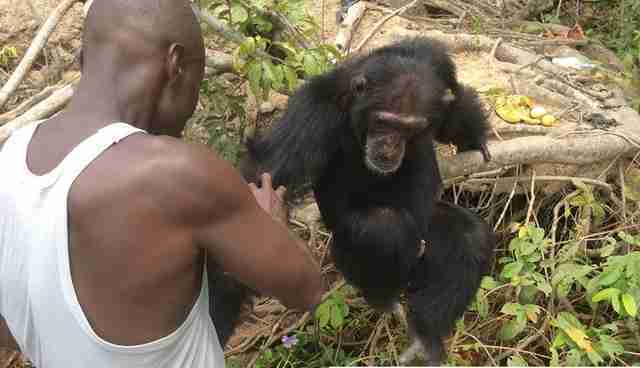 There were 20 chimps in Ponso's group when he was left on the islands more than 30 years ago. Within months, half of them were dead or missing in what one aid group called a "veritable massacre;" the animals were completely unprepared to live on their own after lifetimes in tiny cages. They continued to die off, and for years Ponso, his mate and their two children were the only survivors. At some point NYBC stopped sending food or medical care, knowingly leaving them to die. Unable to watch them starve, Germain began to stop by to feed them, despite his limited resources. In 2013, Ponso's tiny family died within days of each other. According to Germain, Ponso helped him bury them by throwing dirt over their graves. For years, few people knew of Ponso's plight, and his only source of food and comfort was the man who came to feed him. But last spring, NYBC announced it was cutting off funding for a better-known colony of chimps off of Liberia, a move that primatologist Jane Goodall called "completely shocking and unacceptable." 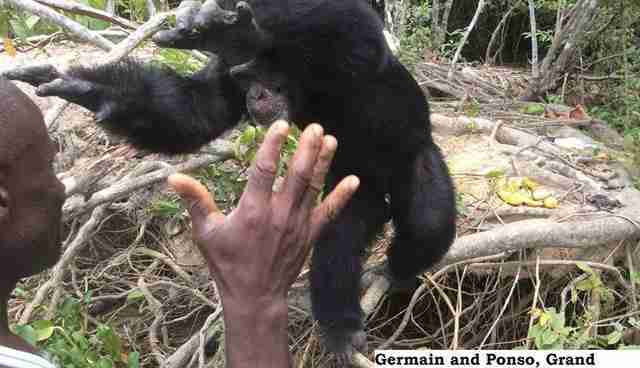 Animal welfare groups rushed to one of the Liberian islands, where they found the chimps had been left without any fresh water. Since then, a team led by the Humane Society of the United States (HSUS), and fueled by public donations, has spearheaded efforts to feed and care for the Liberian chimps - while pressuring NYBC to take up the responsibility of caring for them. If there's one bright spot, it's that the little-known story of Ponso - the chimp who was left to die in a much more secretive manner - came to light. A group of supporters formed SOS Ponso to raise money for the elderly chimp - who spends his days alone on the island despite his social nature - and to make sure he receives a shipment of fresh food every day. HSUS hopes to turn the Liberian island into a sanctuary for the chimps who live there, so they can live out their days safely and in peace, but Ponso's future is a bit less certain. 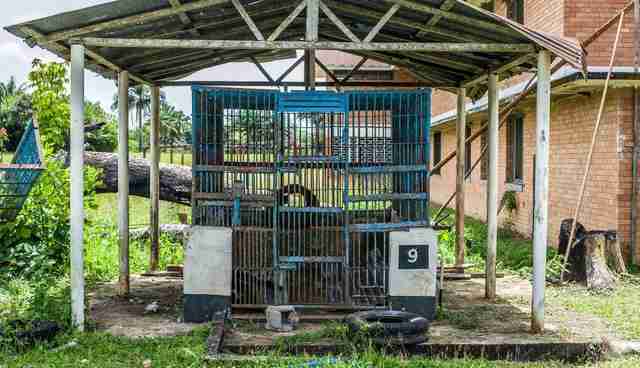 As there's no method for safely introducing him to the Liberian chimps, he can't be moved to the larger colony, HSUS told The Dodo, and taking him out of the country would require documentation and papers. But but that could change soon, SOS Ponso said. "The 'SOS Ponso' coalition is currently in discussion with the Ivorian authorities and several sanctuaries in Africa to work on the best issue for Ponso," the group reported on Facebook. "We all hope that a solution will be found quickly." In the meantime, Ponso will continue to rely on Germain and his other friends to get by. And there's plenty of love to go around. If you'd like to help feed Ponso and give him the future he deserves, you can make a donation to his care team here.